There are so many amazing organizations and individuals helping people, animals, our planet. So many amazing people fighting for those in need, that it was extremely hard to choose just a few of them. But here are some organizations that stole my heart and that I personally support. They are doing incredible work and need your help. Even if you don´t have time to volunteer, or don´t have funds to donate, you can spread their message or page (or this page) and help out. Take a moment to imagine it. You wake up in the middle of the night to the sound of shouts and gunfire. The tensions you’ve tried not to worry about have tipped over into violence. Now you have no choice: you take your family and anything you can carry, and flee for safety. Every two seconds, somewhere on the planet, someone is forced to flee. Don´t think you can´t change peoples lives, because help you´ll find, comes in every shape and size. Imagine a world where you can shop your heart out, leave with nothing, and feel great about it. Choose Love is the world’s first store where you can buy real gifts for refugees, contains practical items like tents, nappies and sleeping bags. But instead of taking them home, each purchase buys a similar item for someone who truly needs it. As little as 3,99€ can provide a meal for the whole family. On a winter’s evening in a cold, dark refugee camp, a hot meal counts for a lot. It’s about more than just relief from hunger. It’s about sharing nourishing, delicious food with people you love, no matter how grim the circumstances. 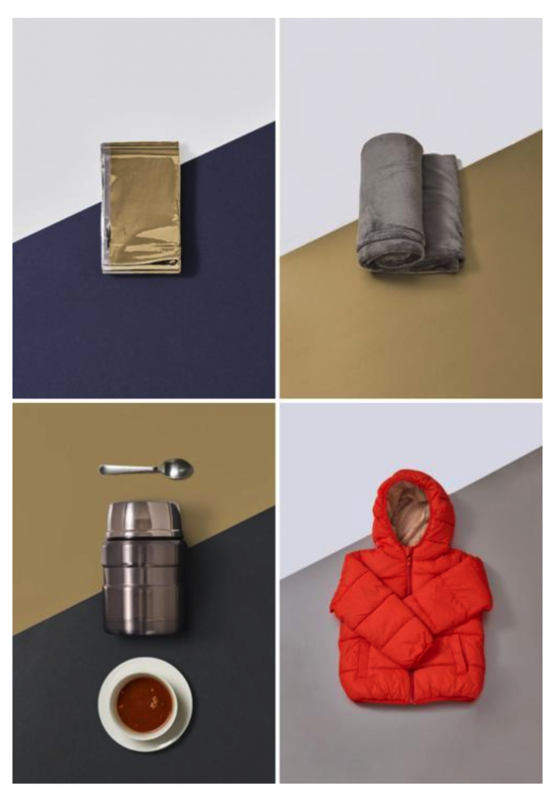 The Arrival Bundle (25,99€) consists of a child’s coat, blanket, thermos flask and an emergency blanket. In times like these, it’s the very basics that can offer hope and keep them going. Help Refugees started as nothing more than a hashtag. In August 2015, a group of friends wanted to fill a van full of donations and drive to Calais. Today they are the largest grassroots aid organisation in Europe. But they are still a group of everyday people, taking action to improve the lives of refugees. They (and I) believe that everyone on earth deserves dignity, a place to call home and a chance to thrive. by supporting my fundraising and 2nd hand Instagram shop Used Goods for Good use or donating through MY FUNDRAISING PAGE. I will make a happy dance for every donation and purchase. Please check my Instagram page and leave a comment or message if you are interested in any of those items. From 30 to 100% of the profit will go to this organization and will be transferred in your name through MY FUNDRAISING PAGE . Refugee Community Kitchen serves nourishing food to displaced people in the UK and northern France. Entirely volunteer-run and donation-based, we are committed to serving wholesome food with dignity and respect to people in need. Since the 1st of December 2015 Refugee Community Kitchen has served over two million meals. They also serve hot food five nights a week at multiple points in London. They are committed to showing up rain or shine, and doing everything they can to make sure that no one goes hungry. People still try to cross the Mediterranean Sea to escape the Libyan hell. The Mediterranean Sea turned into the deadliest border of the world. Ten of thousands of people drowned or went missing since 2000.UNESCO Peace Prize-winner SOS MEDITERRANEE was founded in the belief that no one should drown in the Mediterranean. SOS MEDITERRANEE works as a European association with teams in Germany, France, Italy and Switzerland in a European network, jointly financing and operating the rescue ship Aquarius, which has been in continuous operation since February 2016 in international waters between Italy and Libya. The medical care has been provided by Doctors without Borders since May 2016. Since launching our operation they have welcomed more than 29,000 refugees aboard the Aquarius. September 2018 was the deadliest month in the Mediterranean and all civilian rescue ships were systematically blocked and completely prevented from their work. The Aquarius now sits paralysed in Marseille after having its registration flag revoked twice in two months as a result of concerted political pressure. Support SOS MEDITERRANEE and sign now the petition here and donate here . Their emergency portals and gives us a better picture of the refugee situation in the world. We are now witnessing the highest levels of displacement on record. An unprecedented 68.5 million people around the world have been forced from home. 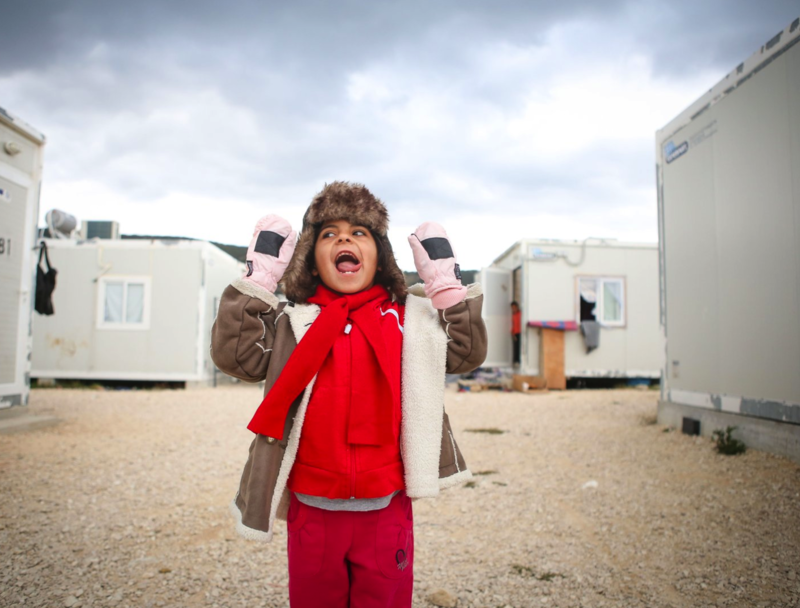 Among them are nearly 25.4 million refugees, over half of whom are under the age of 18. There are also an estimated 10 million stateless people who have been denied a nationality and access to basic rights such as education, healthcare, employment and freedom of movement. In a world where nearly 1 person is forcibly displaced every two seconds as a result of conflict or persecution, that´s why UNHCR work is more important than ever before. Donate here if you would like to support their work. 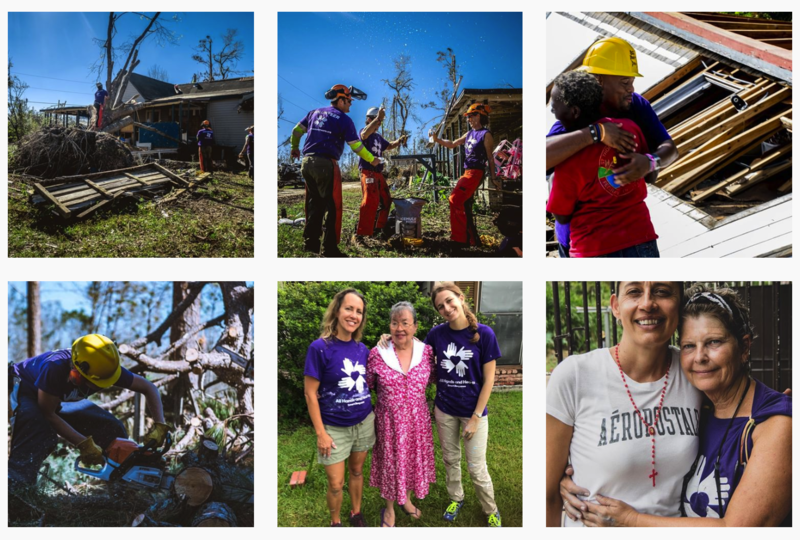 All hands and hearts programs around the world are helping children and families recover from the impact of natural disasters – one house, one school, one community at a time. Florida, North Carolina, Mexico, US Virgin Islands, Nepal, Dominica, Puerto Rico. In communities devastated by natural disasters, the future can seem like a daunting place. Survivors lose so much more than their homes and schools. They need compassionate hearts and determined hands to work alongside them on this long road to recovery. Join in helping to rebuild the future of disaster-affected communities around the world. Donate today and you can be a part of a more resilient future for families and children who have felt the impacts of natural disasters. Your gift today is an investment in Malala Fund programmes that help girls around the world go to school — from creating safe spaces for girls in Northern Nigeria to training young Pakistani women as activists and providing STEM education to Syrian refugees. Donate today to help give all girls the opportunity to learn and lead. FOUR PAWS is a strong, global and independent voice for animals under direct human influence. Their vision is a world where people treat animals with respect, empathy and understanding. I can´t hold my tears everytime they have an amazing (live) rescue. On 28th October 2018 they evacuated eleven neglected wild animals from the Safari Park Zoo in Mbrostar in Fier County, Albania. FOUR PAWS brought the animals – including three lions and a three-legged bear – temporarily to a zoo in Albania’s capital Tirana. As soon as the animals have recovered, FOUR PAWS will transfer them to species-appropriate sanctuaries. In July 2017 FOUR PAWS rescued Saeed together with twelve other animals from a war-torn zoo near Aleppo. They first brought the two-year-old lion to Jordan and then finally to its big cat sanctuary in South Africa in February 2018. A similar fate befell lioness Nala. Animal welfare organisation AAP Animal Advocacy and Protection rescued her in 2017 from the clutches of an illegal breeder for circus animals in France. Austrian blogger Madeleine Alizadeh (@dariadaria) visited LIONSROCK in 2015 when she accompanied the transfer of six tigers from the FELIDA Big Cat Centre in the Netherlands to South Africa. Watch the video for exclusive footage of the Gaza mission, to see the amazing work this organization is doing and Donate here and contribute to a better world for animals. 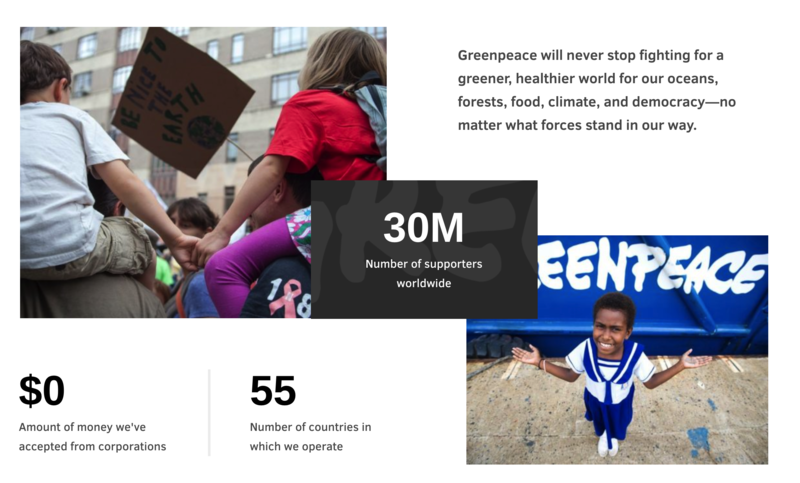 You probably know Greenpeace already, but I can´t talk about non- profit organizations without mentioning them. They’ve been campaigning for a green and peaceful future for 40 years — and they’re not stopping now. It’s time to rise up like never before and fight for our climate and communities. They defend the natural world and promote peace by investigating, exposing, and confronting environmental abuse, championing environmentally responsible solutions, and advocating for the rights and well-being of all people. And they depend on our donations and need our help . From Saving the Arctic, Protecting Forests, Fighting Global Warming, Protecting Our Oceans, working towards a toxic-free future for all, Promoting Sustainable Agriculture, Defending Democracy. These were just a few organizations I respect and support. There are numerous other that fight for people, animals, nature. They all deserve my support, but unfortunately, I´m not able to support them all. And I think you would say the same. But anything we do and give matters. Even if it´s 5€ to give a family a warm meal. The life you can save work with charities whose interventions are proven to effectively improve life and health for those living in global extreme poverty. The Charity Impact Calculator on their page highlights the work of sixteen of the world’s most effective charities , allowing you to compare each organization – and the evidence supporting each intervention – side by side. Unicef Every child has the right to grow up in a safe and inclusive environment. They work with partners around the world to promote policies and expand access to services that protect all children. Unicef has helped reduce child mortality all over the world by working to reach the most vulnerable children, everywhere and works around the world to support quality learning for every girl and boy, especially those in greatest danger of being left behind. And so much more. Charity: Water 100% of your money brings clean water to people in need. With donations, they’ve funded 29,725water projects for 8.4 million people around the world. Mission Blue by Sylvia Earle building a network of Hope Spots large enough to save the blue heart of our planet. Hope Spots are special places that are critical to the health of the ocean — Earth’s blue heart. Some Hope Spots are already formally protected, while others still need defined protection. Under Dr. Earle’s leadership, the Mission Blue team has embarked on a series of expeditions to shed light on these vital ecosystems and ignite support to safeguard them as marine protected areas. Save the blue heart of Europe Three-quarters of the rivers in the Balkans are ecologically so valuable, that they should be completely off-limits for hydropower development. Support the fight against the projected dams. Rainforest alliance Save our Forests and All Life Within. Donate Now. Tens of thousands of acres of rainforests are being destroyed every day—threatening endangered wildlife, rare plants, and local communities who depend on forests to survive. Your tax-deductible gift is critical to save vulnerable ecosystems, fight climate change, and foster sustainable livelihoods for millions of people across the world. Conservation.org People need nature — and for over 30 years, Conservation International has worked to protect it. Through cutting-edge science, innovative pol icy and global reach, we empower people to protect the nature that we rely on for food, fresh water and livelihoods. Climate Reality Project Last year 39 million people tuned in to 24 Hours of Reality and learned what climate change is doing to our planet. The Climate Reality Project is a nonprofit organization funded by like-minded supporters who believe that there is hope in unity and that together we can build a safe, sustainable future. Their work brings real-world stories about the climate crisis to millions of people each week. Through our ebooks, videos, articles, and live events like 24 Hours of Reality™ they are inspiring millios, and helping build unstoppable momentum for enacting solutions. JaneGoodall.org We are a global community conservation organization that advances the vision and work of Dr. Jane Goodall. By protecting chimpanzees and inspiring people to conserve the natural world we all share, we improve the lives of people, animals and the environment. Everything is connected—everyone can make a difference. Cancer research institute Immunotherapy is the most promising cancer treatment of our time. With your support, they can fund more breakthrough research and more cures for cancers of all kinds. Fashion revolution Use your money and your voice to transform the fashion industry into a force for good. Fashion Revolution is working to secure a radical change in the way that our clothing is produced, sourced and consumed. We are pushing for greater transparency in the fashion supply chain through social media outreach, investigative research, innovative events and inspiring, informative content. POW protect our winters Founded by professional snowboarder Jeremy Jones in 2007, POW turns passionate outdoor people into effective climate advocates. POW leads a community of athletes, thought pioneers and forward-thinking business leaders to affect systemic political solutions to climate change. Biking for borders 2 guys on a mission to bike 20 borders and to raise awareness for the importance of education. They want to reach €50.000 to build a co-dedicated school in Guatemala with the help of Pencils of Promise. I´ve been following and supporting their journey on Instagram from the day they started. They are fun, persistent and crazy enough to reach their goal. We need more crazy people like them. Plus I´m a sucker for good design and photos. GromnationSiargao (Philippines) using surfing as a mechanism of engagement for kids to participate in programs that they run, such as beach cleanups, surfboard repair workshops and woodwork/construction classes, afternoon homework help, before school breakfast club and much more. Volunteering in Slovenia Slovene Philanthropy and Prostovoljstvo. Association for the promotion of voluntary work is a humanitarian organization operating in public interest since 1992. Our programs are aimed at increasing the quality of life in the community and advocacy for the socially weak. This list could go on and on. And that´s what gives me hope – organizations and individuals fighting for a better world. Find one that fights for what means the most to you. Don´t worry if you are not able to donate, there are ways you can still have a great impact. Spread the word, sign petitions, volunteer, donate items, organize a fundraising, maybe ask your friends to donate instead of buying you a birthday/Chrismas gift this year or switch your search engine. Yes, you read that right. Ecosia search engine uses the profit they make from your searches to plant trees where they are needed most. Get the free browser extension and plant trees with every search.